Well, another sunny day paddling with Jon Walpole and friends. Jon was looking for a nice kayak trip for this Sunday. The Columbia Gorge was an option. The weather prediction for today in the Columbia Gorge was for E winds 11-17, gusting to 25 (mph). 20% chance of rain. Though the tidal influence at Bonneville is small, the tide would be ebbing all the time we'd be paddling. (High tide Vancouver: 9:23am, low 17:39.) Not bad. 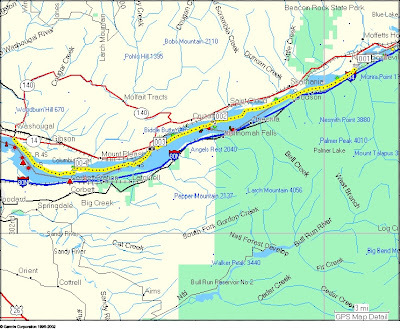 So he planned a trip from Bonneville Dam to Washougal. I'd never paddled that part of the Columbia so I was definitely up for it. Jon, Jenny and I met at Steamboat Landing in Washougal at 9am (a civilized time - I'd even had time for coffee and breakfast). We took Jon's car up to the boat ramp on Hamilton Island for our launch. As we drove to the boat ramp we got an awe-inspiring view of massive amounts of water coming over the Bonneville Dam spillway. Now, I'd never been to this spot... but the boat ramp seemed awfully close to the dam's spillway if you ask me. And the really big red sign just a few feet east of the boat ramp that said something like "Danger - Do not proceed past this point" also was pause for reflection. Still, we got gear situated, did warm up exercises, etc. As we were getting ready pair of bald eagles flew by. A good omen to be sure. The boat ramp itself runs into a little eddy. We launched, and leaving the eddy into the main channel turned out to be a very pleasant little bit of acceleration to start our voyage and not the Deception Pass eddy peel-out I was expecting. We got on the water at 10:20. On the chart it's clear that the Columbia is pretty narrow at that point, but it was striking to actually be there. It really feels narrow. And alot of water moving. We were paddling gently yet cruising along at a nice rate of knots. In that area of strong current we were often going 10 mph: 8.7 kt! I was thrilled. We did a bit of eddy play here and there. Some impressive eddylines. Not Deception Pass, but alot more conveniently located! Of course the river soon widened and the current slowed to pretty much what you'd expect -- appr. 2 kt. We got more current here and there, but never got going that fast again on this voyage. During the early part of the trip there was next to no wind. So the current was a great help. After awhile the wind picked up, but it never got to the promised 17 mph and I'm sure I never felt a 25 mph gust. But the wind did pick up to appr 15 mph and we got some small waves. These small waves were great for practice. Trying to eek as much energetic help from them as I could. And lots of opportunities for really working on getting my speed right for catching a wave, stern rudder, etc. After lunch the 15 mph E wind was still helping us. We continued to work on catching those small waves. We planned to pull into the eddy behind Phoca Rock to relax. But as we approached we saw that there were at least ten sea lions hauled out on the rock. As we passed they clearly weren't happy with us. My they can be noisy! And big! And about the time we were going to pull into the eddy behind Phoca Rock the all jumped into the water. I was sure they were heading for us! So... we didn't pause there. Where are the orcas when you need 'em? We meandered at the base of some beautiful basalt cliffs at Cape Horn. Some nice waterfalls. Some nice spots to play among the rocks. We did pause for a break at the east end of Reed Island. Then off for the final bit back to Steamboat Landing. As we neared Washougal the wind died completely and it felt like summer. We made use of the calm water to practice paddling in reverse for awhile. Always good to do. Then were were back just before 4pm. A total of 19.33 nm -- 22.3 miles! Our moving average speed was 4.2 kt across the entire day. Max speed: 9.7 kt :) Moving time: 4hr 32min. Easily the most distance I've ever covered paddling on a day trip. And I felt great at the end of the day. I've definitely had days when I was much more tired after not covering as much distance - like every BCU 4 star training I've had the good fortune to take (a heartfelt thank-you to Shawna and Leon and Karl and John Wallum). What a great day. We had beautiful weather. Great company. The current helped us out. We saw eagles and a falcon of some variety. More sea lions that I'd care to. But bittersweet at the end... got back to the car and had a voice message from my Uncle Lou's partner. My Uncle Lou, a fellow kayaker, is in his 80's and has been getting alot weaker lately. His partner phoned to tell me he's not likely to live to the end of the month. His heart is just giving out. He hasn't been out kayaking in some years now, but was very encouraging when I took it up and has enjoyed my trip reports. He always wants more details when we talk on the phone. I know we all get old, but I will miss him. As usual, click the picture below for more pictures. Jenny took most of the good ones!